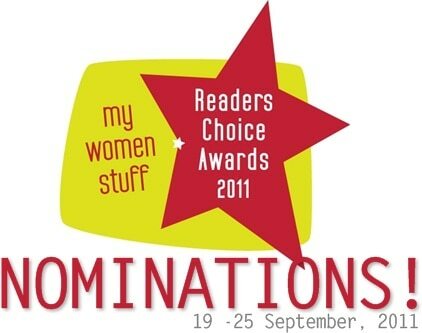 Home » Entertainment » My Women Stuff Reader’s Choice Awards 2011 – NOMINATIONS! My Women Stuff Reader’s Choice Awards 2011 – NOMINATIONS! Nominations close on 25 September 2011. FIRST! OK I will not make this a completely useless comment, so thanks PB and let’s get rolling with the nominations! I have a few that I hope will win! Haha you made it! 😀 I hope your nominations make the cut too! Thus far, its such a mixed bag, I don’t even know who’s going to make it. Seriously, its so varied! I’ve voted! Any word on the meet-up? Yay! No one product or brand is standing out, which is very interesting! I do think we’re having to see a LOT of nominations before any pattern emerges. I could only fill up what I’ve actually used, not the hypotheticals 😛 Oh well. That’s all we’re asking for 🙂 Faves! 😀 Thanks for taking part. Oh it’s so hard to pick favourites!! LOL I’d have a tough time picking too! Same here! I don’t know if I could even vote hehe… Thanks for taking part! Woooo that was fun, though makeup-wise I’m stumped on blush and eyeshadows because I don’t use them! 😛 I thoroughly enjoyed it 🙂 Looking forward to the meet! Heh not to worry. I’m seeing lots of empty “holes” too where people have skipped over categories, probably coz they can’t decide 🙂 Will have details up at the end of the month. Done, I probably threw your survey completely off with my esoteric choices. LOL! Yes, your faves and we just never know who’s nominating what – I’m seeing some really esoteric items pop up in there. Its absolutely amazing! Its not just you Marina. I had to think too LOL! No favourite perfume? =( I groaned when I came to the “Favourite Makeup Brand” section. How to choose la? I have a favourite for lippies, another preference for blush and another for foundation. Ahhh! My brains blew. Voted! Some I just couldn’t decide…..